When it comes to wallpaper, your life can become really expensive, really fast. 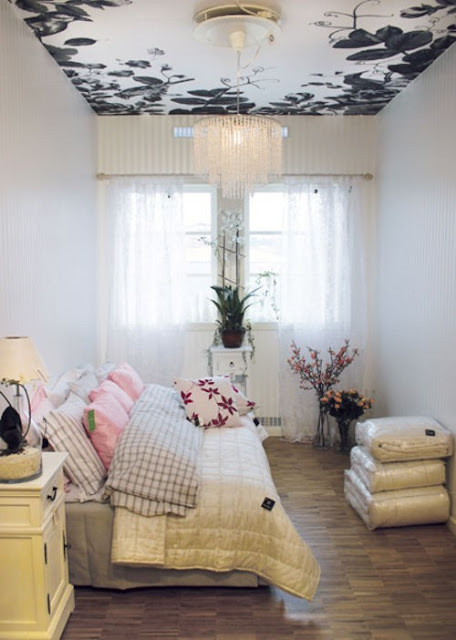 But with so many beautiful wallpapers out there, it would be a shame to skip out on it completely, which is why I totally love the idea of papering a ceiling. Wallpaper can add such great visual interest to a room, and on a ceiling it has the opportunity to pop even more than if it were on all four walls. Think of your ceiling as an accent wall -- the perfect place to paper. Here are some beautiful examples that this post just couldn't do without. I really appreciate how traditional this wallpaper is in comparison to the modern tendencies of this room. Incredibly cool contrast. 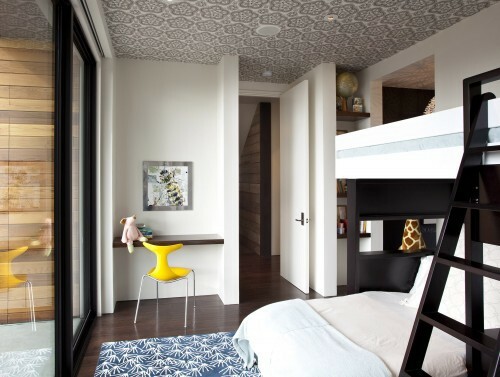 A patterned wallpaper is grounded by bold accessory choices to keep this busy accent ceiling in check. A country kitchen at its finest. 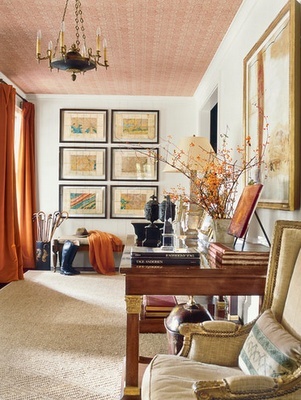 A ladylike burnt orange wallpaper plays off the other beautiful orange colors intermixed with lovely woods. Geometric patterned wallpaper -- a favorite of mine. 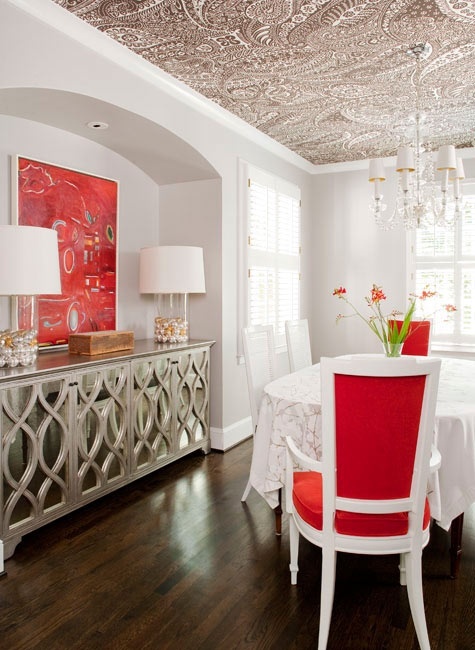 Paisley-like wallpaper instantly glams up this dining room (the mirrored credenza helps out a bit, too!). 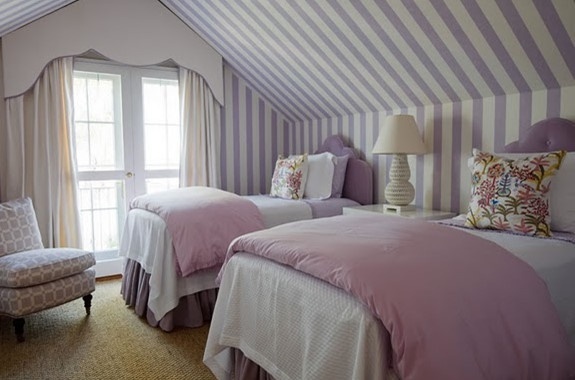 Surrounded by this soft purple striped wallpaper, this room is sweet and cottage-inspired. A graphic-print wallpaper is seemingly random and unexpected in this small space -- but it works! 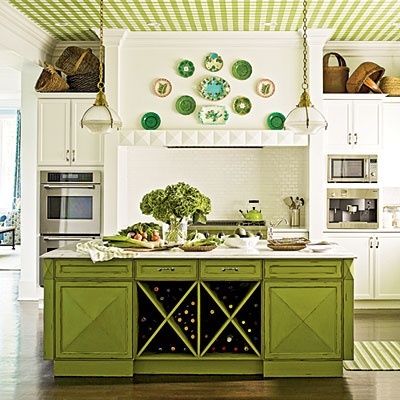 What do you think of wallpapered ceilings? adore all of these pictures! so glad I found your blog!! I think so, too! 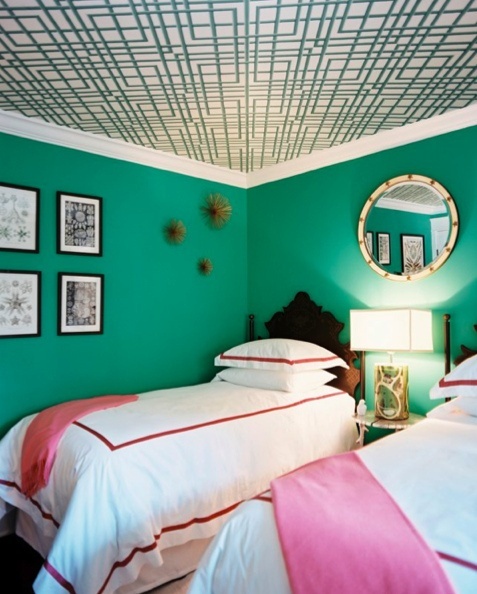 And with one accent wall (or one accent ceiling), it's a great way to go if you don't want the commitment of an entire room full of color and pattern, you know? Thanks so much for reading! I adore wallpapered ceilings! these are some great photos of them! Thanks, Kylee! And thanks for coming by!